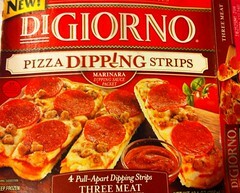 DiGiorno has release a personal sized version of their Three Meat Dipping Strips. Personal-sized breadstick-y like pizza strips with a side of dipping marinara ? DiGiorno and I have a relationship with lots of ups and downs. I love one thing they release then hate the next. So it’s good that they keep rolling out these things so maybe in the end the record reflects them winning more than losing in the JFC camp. Like they are “so worried” about what I think. ha. So what you see here is what it looks like out of the box and ready for the oven. One of the funny things about the three-meat pizzas from DiGiorno is that the ones I buy always end up VERY LITE on the sausage topping. 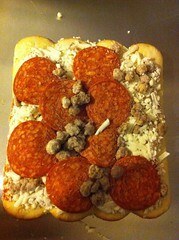 The pie is supposed to be Pepperoni, Hamburger, and Sausage – but as you can see it’s mainly pepperoni and hamburger. Which is fine. That two-meat combo is very popular here in DFW and I am disappointed to see just how many frozen pizzas do not offer hamburger of any type as a topping. Also included is a frozen packet of sauce that you are to warm up in the microwave – similar to the WYNGZ they have. Looking at this one final time before I pop it into the oven and I am hopeful that this turns out awesome. I like breadsticks and having some loaded like this would be a great dinner or snack. I would like to add this to the arsenal of go-to moves and have a few of these on hand in the freezer for when I get that “breadstick-y” craving. About halfway through I remember that I have some provolone that sits lonely in my fridge. So I grab a couple of slices and top off these sticks. These came out perfectly cheesy-gooey and I actually enjoyed the side of marinara. I am not sure about the actual bread part of these though. They weren’t very soft but rather crunchy and hard. I didn’t even cook them the full-time suggested on the box. My oven runs a little hot so I may have over cooked these. Good news is that just means another taste test! Even extra crunchy they were still not bad to be from the freezer. I can see me totally loving these at 4am. Or maybe even making a version of these using all fresh ingredients? 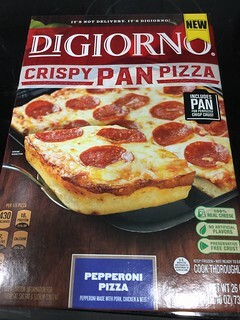 DiGiorno is back with a brand new invention, the new “pizzeria” line. Today we chowed-down on the “primo pepperoni” version. I am a bit of a sucker for these new pizzas because I believe they are actually trying to perfect the frozen pizza product for the fans. Competition is pretty harsh these days. These premium pizzas run anywhere from 4-10 bucks. In terms of price, that is pretty cheap to have a pizza waiting for you in your freezer at any time. On the other hand – these days I can find just about any pizzeria around here to make me one fresh for 10 bucks or less. So as encouraged as I am, I am also quite the critic of them. You probably guessed that by now, though. So I unwrap and pop the “primo” in my oven- per the directions. Minutes later, I had what you see on the right. Now I gotta say, this pizza turned out looking EXACTLY like the photo on the cover of the box. I don’t know why, but I was impressed by this non-factor. Truth in advertising!!! So major props to the boys at the DiGiorno group for that. And how did it taste? Well, it was pretty good, but nothing spectacular. I didn’t get a “pizzeria-style” experience – whatever that means. The crust seemed like a hand-tossed style but it didn’t rise much in the oven. All the green specs you see were bits of seasoning – that stood out and helped a pretty basic pie. 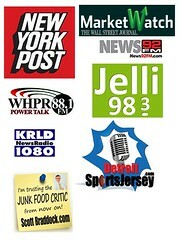 I probably wouldn’t buy it again – preferring the DiGiorno Meatball Marinara that I reviewed here. But I give the guys credit for trying. It wasn’t a bad pie, just not one of their best.